The candidate should hold a Ph.D. in a related area, although exceptional Ph.D. candidates at the ABD stage might also be considered. The ideal candidate should have expertise in social network analysis, network science, and data science (including familiarity with R, Python and databases), and an interest in the study of science and scientific collaboration. The Gatton College of Business and Economics’ Department of Management invites applications for a one-year postdoctoral position in the area of social network analysis and network science, with a focus on scientific collaboration and team science. 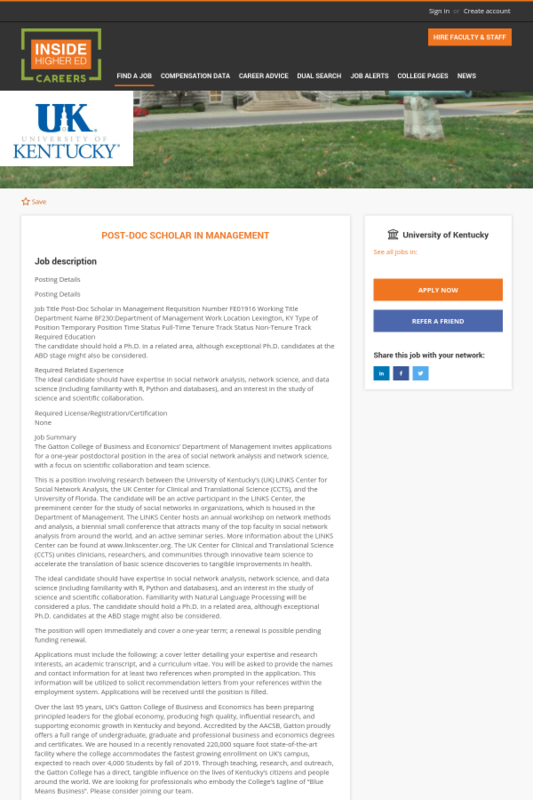 This is a position involving research between the University of Kentucky’s (UK) LINKS Center for Social Network Analysis, the UK Center for Clinical and Translational Science (CCTS), and the University of Florida. The candidate will be an active participant in the LINKS Center, the preeminent center for the study of social networks in organizations, which is housed in the Department of Management. The LINKS Center hosts an annual workshop on network methods and analysis, a biennial small conference that attracts many of the top faculty in social network analysis from around the world, and an active seminar series. More information about the LINKS Center can be found at www.linkscenter.org. The UK Center for Clinical and Translational Science (CCTS) unites clinicians, researchers, and communities through innovative team science to accelerate the translation of basic science discoveries to tangible improvements in health. The ideal candidate should have expertise in social network analysis, network science, and data science (including familiarity with R, Python and databases), and an interest in the study of science and scientific collaboration. Familiarity with Natural Language Processing will be considered a plus. The candidate should hold a Ph.D. in a related area, although exceptional Ph.D. candidates at the ABD stage might also be considered. The position will open immediately and cover a one-year term; a renewal is possible pending funding renewal. Applications must include the following: a cover letter detailing your expertise and research interests, an academic transcript, and a curriculum vitae. You will be asked to provide the names and contact information for at least two references when prompted in the application. This information will be utilized to solicit recommendation letters from your references within the employment system. Applications will be received until the position is filled. Over the last 95 years, UK’s Gatton College of Business and Economics has been preparing principled leaders for the global economy, producing high quality, influential research, and supporting economic growth in Kentucky and beyond. Accredited by the AACSB, Gatton proudly offers a full range of undergraduate, graduate and professional business and economics degrees and certificates. We are housed in a recently renovated 220,000 square foot state-of-the-art facility where the college accommodates the fastest growing enrollment on UK’s campus, expected to reach over 4,000 Students by fall of 2019. Through teaching, research, and outreach, the Gatton College has a direct, tangible influence on the lives of Kentucky’s citizens and people around the world. We are looking for professionals who embody the College’s tagline of “Blue Means Business”. Please consider joining our team. Familiarity with Natural Language Processing is preferred.